Italy – Creative technology expert Realtime Environment Systems Ltd (RES) has completed an 18-month project, working in collaboration with media agency Innovision and content creators Immersive, to design, install and pixel map 1000s of LEDs for two of four giant metal LED sculptures created for Expo Milano 2015. 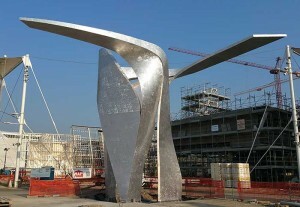 Situated in the heart of the Expo, in the Piazza Italia sponsored by Siemens, the four 10m high shimmering tree-like sculptures anchor the four corners of the central square. Conceived by Polish-American artist and architect Daniel Libeskind, each structure's dynamic form spirals out of the ground and spreads into two branches spanning ten metres above the square. Crafted from brushed aluminium and fitted with a grid of innovative LED technology, the sculptures' 'wings' animate the public space with a constant flow of pulsating patterns and imagery that relate to the theme of the Expo: health, energy, sustainability and technology. Visually stunning, these pieces demanded some considerable technological and creative expertise to deliver. RES worked alongside London content company Immersive and its end client Innovision to ensure that the content for the LED display could be technically delivered to the surfaces without issue and there were a number of factors they had to consider. "Together with Innovision and PAI Group we researched a plethora of architectural plans to determine how high we could push the resolution of each surface before we ran into heat and cabling issue. In the end we achieved a very fine balance between ensuring the images could be seen, at the distances we wanted, but also that the installation would not overheat in the hot Italian sun," explains Mark Calvert, managing director of RES. With an agreed resolution of 40mm the next challenge was to find a powerful media server that would fit in the small base of each sculpture: "It was key for us to create a system that was small enough to fit into a cabinet at the foot of each sculpture. In the end we worked in close collaboration with JB Toby from Avolites in London and based on combined R&D we developed a system called the 'M2'," Calvert explains. "The M2 is actually so small that a powerful 2 HDMI output media server system can fit in the palm of my hand!" Not only is the M2 the best possible interface between the creative content and the LED product but Ai is also ideal for a number of other reasons: "One of the key motives for choosing Avolites Ai for this project, and indeed many others, is because of its capacity for 3D pre-visualisation. It basically allows us to show clients and our creative partners how the content will look in the context of its environment before that environment even exists. For Siemens this was ideal, as they could see how the content would work in the Libeskind sculptures without having to make expensive 3D renders of them." RES also created media templates for each of the two sculptures, which gave Immersive's animators a shape foundation for all the content. "We then pixel mapped the 1000s of LEDs from the Ai server with the content produced, which will now play back a five-minute AV content loop. The result is stunning animated digital graphics that welcome visitors to the Expo day and night." 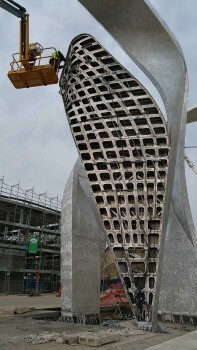 Phil Mayer was Lead Ai Technician for the project, with support from Ben Stern and Annalisa Terranova working for RES Ltd. Phil recalls: "We used the Ai Server's flexible built-in timecode functionality to provide frame-accurate synchronised playback of media across the servers in each sculpture. We were then able to remotely adjust the playback schedule throughout the six-month duration of the installation, to take into account changing lighting conditions on site." John Munro, creative director at Immersive, comments: "Immersive always chooses Ai, when working in permanent or temporary installations. Its flexibility and rock solid stability is second to none. On this particular project it excelled at client pre-visualisations all the way to last minute, on-site timeline edits." Twenty million people are expected to visit Expo 2015 in Milan, which takes place between 1 May and 31 October 2015.